Is it possible to create new paintings by Andy Warhol, 30 years after his death? Warhol got other people to do most of the work first time around - and now a British artist has recreated some of his most famous works using exactly the same methods and materials. There was a reason Andy Warhol called his legendary 1960s New York studio The Factory. It housed something resembling an assembly line of assistants working on his famous screenprint paintings of icons like Elvis Presley, Marilyn Monroe and Jackie Kennedy. On occasion, his assistant and his mother even signed the paintings on his behalf. "I think somebody should be able to do all my paintings for me," Warhol told interviewer Gene Swenson in 1963. "I think it would be so great if more people took up silk screens so that no-one would know whether my picture was mine or somebody else's." More than 50 years on, Paul Stephenson has done that - and ignited a debate about what can be done after an artist's death. Stephenson has made new versions of Warhol works by posthumously tracking down the pop artist's original acetates, paints and printer, and recreating the entire process as precisely as possible. Stephenson's project began when he bought 10 original Warhol acetates - the enlarged photographic negatives of those icons that Warhol used to create his screenprints. While Warhol's assistants did many parts of the physical work, the artist, who died in 1987, was the only one who worked directly on these acetates, touching up parts of the portraits to prepare them for printing. Stephenson took the acetates to one of Warhol's original screenprinters in New York, Alexander Heinrici, who offered to help use them to make new paintings. 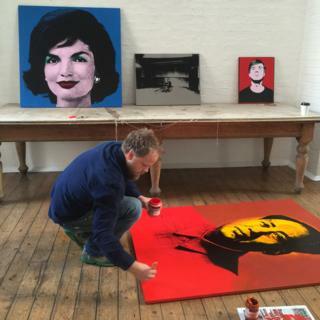 Those paintings - of Chairman Mao, Jackie Kennedy, an electric chair and a self-portrait of Warhol himself - are going on show at the Buy Art Fair in Manchester at the end of October. He's titled the series After Warhol. "I'm not saying they're Warhols," Stephenson says. "It's a forced collaboration because the original author doesn't know anything about it." He may not claim the new paintings should be considered posthumous Warhols, but Rainer Crone, one of the leading Warhol authorities and the first to catalogue the artist's work, said they could be. Crone died in 2016 but he saw Stephenson's recreations and sent him an email saying "paintings made with these film positives under described circumstances and executed posthumously by professionals (scholars as well as printers) are authentic Andy Warhol paintings". Stephenson's paintings are not identical to Warhol's originals, but are near enough. Stephenson says he's simply asking a question: "If the world-leading Warhol scholar says it's a Warhol, and you do everything in the mechanical process that the original artist did, and the original artist said 'I want other people to make my paintings', which he did - what is it? There are other examples of works being made in an artist's name after their death. The estates of Degas and Rodin have made bronze sculptures using their original designs. They are sold as posthumous works, with lower prices to match. The fact the price tags for Paul Stephenson's recreations are missing a few zeroes - they will be on sale for £4,000 and £10,000 - is proof that he's not expecting anyone to regard them as authentic Warhols. Warhol expert Richard Polsky, who offers a service authenticating Warhol works, says Stephenson's paintings shouldn't be regarded as posthumous Warhols. "I like the fact that he's honest - he's not claiming Andy made these, he's claiming he made them," Polsky says. "I also notice he's priced them very modestly. All that's good. "It sounds like he's trying to extend Warhol's career, so to speak, even though he's dead. There's a charm to that, but it just seems so shallow." There's a key difference between someone else making a Warhol painting in his Factory during his lifetime and someone else making one now, according to Jessica Beck, curator at the Warhol Museum in Pittsburgh. "He was always involved in that final product in some way," she says, explaining that the artist oversaw everything at the Factory and did get involved in other ways after the inception. "This idea of taking his screens and recreating new Warhols without being in dialogue with him - obviously, because he's now dead - that's problematic." But Stephenson's works may still appeal to people who want to impress their friends by appearing to have a Warhol on their wall, but without spending millions. Buy Art Fair runs from 27-29 October in Manchester. A documentary titled Business of Making Art, featuring Paul Stephenson, will be screened at the fair on 28 October. Can you love a fake piece of art?